I couldn’t stop myself from watching a real estate investing TV infomercial last night. You know the one, the guy promises big bags of cash if you’ll just buy his special, super-secret “system.” In the infomercial, you can’t help but notice that the “millionaire” guru is driving a new Mercedes-Benz. Sadly, a lot of folks tell themselves, “I gotta get me some of that!” and then pick up their phone and dial the number. The next morning I got in my vehicle, fired up the engine, and headed out to do property inspections at some rentals. While driving, I thought again about the guru’s Mercedes. No successful investor we know drives an expensive luxury car. Can you imagine pulling into a tenant’s driveway in a $75,000 land yacht? Talk about going over like the proverbial lead balloon! 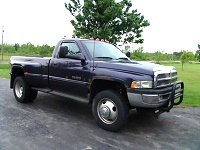 After lovingly patting the cracked dashboard of my 1998 Dodge dually, diesel, 4×4, pick-em-up truck that has nearly 300,000 miles on it, I realized that I am my truck…and not some fancy-dancy, new Mercedes! You see, my truck is old, has a lot of miles, the seats are ripped, and there are a bunch of rust spots on the exterior. My appearance is similar. I’m bald, have a gut, hair is growing out of my ears (who knows why), I need glasses and my hearing is pitiful. But that’s just the superficial, outside, surface stuff. It’s only the stuff people see – and we all know that it’s what’s under the hood that counts! For example, my truck’s engine has been well maintained…in fact, after doing some tweaking, it has a lot more horsepower than when I bought it. The trannie is new and is a lot stronger than the original one. All in all, my Dodge can easily pull the load without breaking a sweat. I’m also not much to look at. But I still do five triathlons a year, compete in several 100 mile bike races a summer and swim a couple of miles each week – in a Speedo!!! (How’s that for a visual?) In addition, I can spend a full day knocking on seller’s doors and discussing their real estate problems without giving it a second thought. I say all of that to say this: Even though you can’t fence time, don’t let time – and a little wear and tear – keep you from being the person you want to be. At this month’s real estate investors meeting, a gentleman asked some how-do-I-get-started questions. He was a few years older than me, knew he would be retiring in a few years, and was thinking about buying some investment real estate to help him live comfortably once he retired. The thing was, his kids told him to look in the mirror at all his grey hair. They said he was too old to start investing in real estate. Thankfully, this guy was full of sand and was not letting his naive kids’ opinions get in his way. If you are like me and have chrome dome and/or grey hair on the top of your head, don’t let time be an excuse for not succeeding. As the old saying goes: You must either get busy living or get busy dying. We hope you choose to get busy living!